This 4" tall x 5" wide x 6.5" deep dragon is a pin cushion. Fabrics will vary. She holds your snipping scissors in her tail. Available in blue, green, or purple. This 6" tall dragon is very useful. He holds business cards in his feet, a pen in his mouth, a pen in his tail, plus 2 more pens in holes in his back. Shown in blue, also available in green, purple, or black. This 5" tall, 10" long Mama dragon proudly gazes at the dragling on her belly. Available in stained finish only. 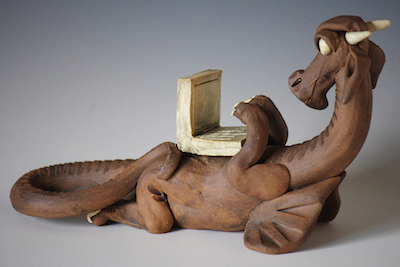 Bellytop is a 10" long dragon catching up on his email on his bellytop computer. He is available in natural clay with porcelain details and staining for enhancement. Where's my phone? Where are my keys? Where's an ink pen? Wall-mounted Holdem holds them all for you. He is about 7" tall X 6" wide X 4" deep. This one is the natural clay with staining. A pair of dragons, male (with horns) and female (with 3 spikes) keep your favorite fantasy books organized. Each one is about 8" wide X 8" tall X 6" deep. The male is reading "Game of Thrones", and the female is reading "Harry Potter." But, you can message or call me to change the book titles to your favorites. Shown in the natural clay with staining. Sorry, no other color choices. 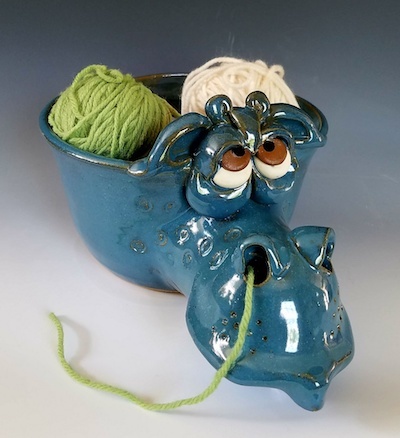 11" tall knitting dragon sits over a ball of yarn. Pull the yarn out of the "tail" slot in the back. Available in blue, green, or purple. This functional sculpture is about 6" tall and 9" wide. The yarn will come out of the nostrils OR the cut opening in the back. Shown in blue; also available in black, green, or purple. Allow four weeks for delivery. Call Clay Images at 573-873-2820 if you prefer to send a check or money order.